If the wp-login.php login form is submitted empty, the page refreshes and no error message is displayed. Expected behavior would be a shake and an appropriate error message. empty_username_password_errors.JPG​ (23.1 KB) - added by birgire 16 months ago. 42985.diff​ (1.0 KB) - added by birgire 16 months ago. 42985.1.diff​ (516 bytes) - added by audrasjb 7 weeks ago. 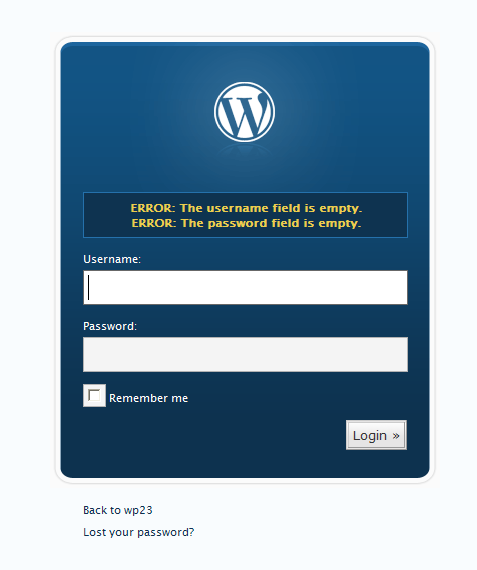 Patch refresh: display errors in wp-login.php when email and/or password fields are empty. error-both-fields.png​ (39.8 KB) - added by audrasjb 7 weeks ago. error-password-field.png​ (38.6 KB) - added by audrasjb 7 weeks ago. error-user-name-field.png​ (38.7 KB) - added by audrasjb 7 weeks ago. 42985.2.diff​ (992 bytes) - added by audrasjb 6 weeks ago. If the username and password fields are both empty, then the corresponding error is overridden with $user = new WP_Error( '', '' );. That means no errors show up for the login form. Then, in WordPress 2.5 these 2 messages disappeared. Still have to find the relevant change. I wonder if the wp_signon(), should be allowed to return the empty username and password error and handle it in the wp-login.php, for better flexibility. Seems the original change was the login refactoring in , see #5405. Before this change, the last switch case (login/default) displayed both errors and checked also for $_POST. Currently there seems to be no unit tests for e.g. wp_signon(). Checking that both fields are empty and the request is a POST request would handle this nicely, as @afercia mentioned above in WordPress 2.3 doing it this way. If wp_signon() is allowed to return the empty username and password error, then it could be handled instead in wp-login.php, to avoid adding extra $_POST check into the wp_signon() function. This is the approach in 42985.diff​. To clarify (before it gets asked) why WordPress doesn't hide error messages related to the username and that's not considered "information disclosure", see https://core.trac.wordpress.org/ticket/3708#comment:3 and all the following tickets closed as wontfix, for example #4290. Unfortunately we're running out of time for 5.1. This ticket does have a patch (probably needs a refresh). Needs to be tested in depth and reviewed. Punting to 5.2. I refreshed the patch in 42985.1.diff. Tested on my side, works fine. We don't need the wp-login.php change anymore to make it working. I think the change in wp-login.php is necessary to make the "interim login" work correctly. Otherwise, users will see the error messages instead of the message "Your session has expired...". @birgire, correct? Accessibility: Login: Display error messages when both the username and password fields are empty. For accessibility and usability, if an input error is detected, the item that is in error needs to be identified and the error needs to be described to the user in text (WCAG Success Criterion 3.3.1). The login form displays an error when the username field is empty or when the password field is empty. It omits to do so when both fields are empty. 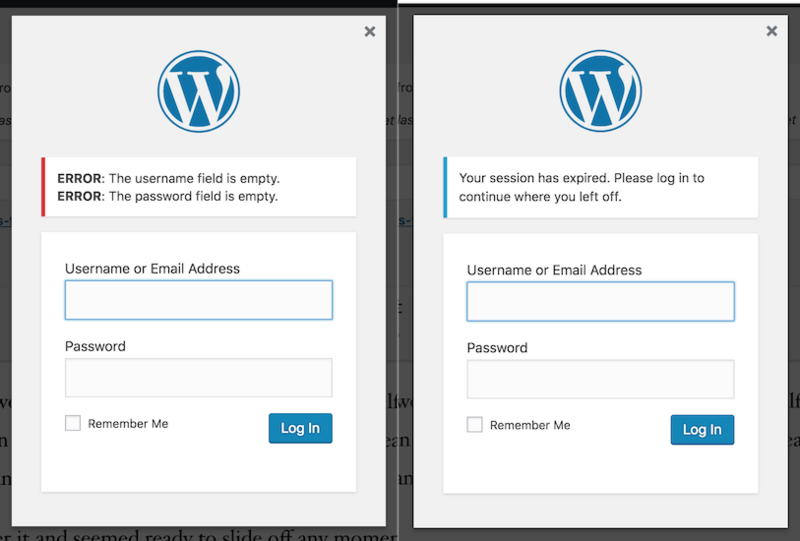 This change restores the login form behavior to the one that used to work in WordPress 2.3 (!) and displays the related error messages also when both fields are empty.